Universal Basic Income (UBI) – a regular cash payment made to individuals without means testing or conditionality – has been described as an idea whose time has come, supported across the political divide from free market libertarians to left wingers attracted to the idea of emancipating the working classes from wage labour. With disabled people as one of the groups at the sharp end of “welfare reform”, DPAC are less convinced that UBI can deliver the solution so desperately needed to fix the social security system and fear that the introduction of UBI could further disadvantage those who have suffered the most since 2010. Today we are launching our report “Universal Basic Income: Solution or Illusion” based on a longer paper we published on the same subject last year. 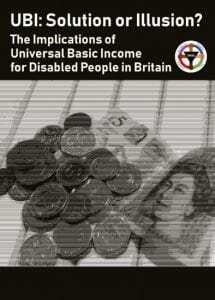 A basic income will not cover the extra costs of disability and therefore a system of disability benefits will still be needed alongside a UBI. Disabled people are concerned that the need to finance universal basic income payments could lead to even more pressure to save money by restricting eligibility than under the current system. With the crisis in social care having taken disabled people’s quality of life dramatically backwards, there are also concerns that the introduction of a UBI will prevent a reversal of cuts that are leaving increasing numbers trapped in their own homes without access to food, water or the toilet for hours at a time, day and night. The report comes at a time when there is growing support for the idea that Universal credit cannot be fixed but must be scrapped. That leaves us with the question of with what to replace it. The idea of a UBI – with no means testing or conditionality – sounds attractive but the reality would be very different. A central principle underpinning any social security policy development must be meaningful engagement with the lived experience of those affected. The “test and learn” approach of Universal Credit has, as identified at the end of last year by the United Nations’ special rapporteur on extreme poverty, made guinea pigs of the most disadvantaged members of society. The disastrous impacts of UC were entirely predictable but ignored. Transformation of the social security system won’t succeed through top down policy making: it has to be designed to meet need and to do that you need to listen to those at the grassroots. Disabled people have experienced to our detriment through UC and the personalisation of social care how what can be presented as progressive ideas can in practice affect widespread harm. We must not repeat this mistake through UBI. I am afraid I could not read the entire report. The bias was oozing with every full stop. Clearly whoever wrote this is completely opposed to any debate on UBI. So what do you propose as a replacement to universal credit, within the existing capitalist society we live in?